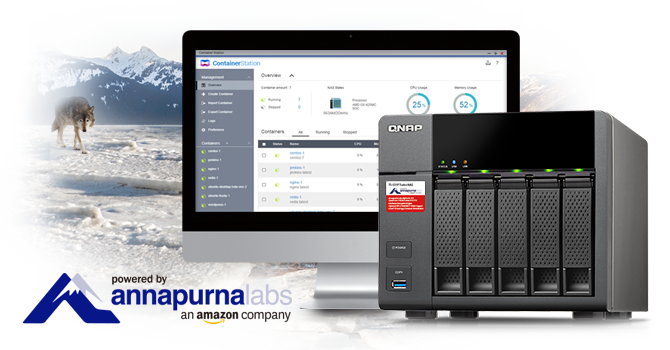 Taipei, Taiwan, November 12, 2015 - QNAP® Systems, Inc. today announced the release of the brand new 5-bay TS-531P business NAS. A tower form factor NAS with an Annapurna Labs Alpine AL-314 quad-core 1.4 GHz ARM® Cortex-A15 processor and 2GB/8GB DDR3 RAM (upgradable to 8GB), the TS-531P features RAID 5/6 support, hardware-accelerated encryption and SSD cache support. With four Gigabit LAN ports, the TS-531P can deliver up to 418 MB/s read & write speeds and allows users to install a 10GbE SFP+ or 10GBASE-T network expansion card to connect to 10GbE networks. The TS-531P also supports Container Station for LXC and Docker® lightweight virtualization technologies, offering businesses an ideal cost-efficient and high-performance NAS solution. The TS-531P supports Container Station, allowing users to operate Linux systems and download various apps from the built-in Docker Hub® Registry. Container Station allows users to easily manage multiple containers with a flexible user interface, informative dashboard, permission settings, and container importing/exporting. Container Station will also support the Online Document app (currently in development) that allows users to directly view, edit and store files of various types (office documents, images and text files) on their TS-531P without the hassle of back-and-forth file transfers. QNAP provides various apps to improve user workflow and productivity, including Qsirch for quickly finding NAS data with its powerful near real-time full-text search engine; Qsync that supports centralized configuration and can remotely erase the Qsync folder to avoid data breaches; and Cloud Drive Sync for synchronizing files between the TS-531P, Google Drive™ and Dropbox®. In addition, the TS-531P's front-panel USB 3.0 port features a convenient one-touch-copy function that allows users to quickly back up data to other external drives. Businesses can rely on the scalable TS-531P as a future-proof storage solution. The TS-531P supports online storage capacity expansion by attaching two QNAP expansion enclosures (8-bay UX-800P and 5-bay UX-500P) allowing the NAS to be scaled to support up to 21 hard drives, making it ideal for storage-intensive applications such as video surveillance, data archiving or TV broadcast storage. With the support of QJBOD Express (JBOD enclosure roaming), users can migrate data from the TS-531P to another NAS using a JBOD enclosure without needing a network connection, saving considerable time for migrating a large amount of backup data. 5-bay tower model; Annapurna Labs Alpine AL-314 1.4 GHz quad-core processor with floating point unit , RAID 5/6 support, hardware-accelerated encryption engine; hot-swappable 2.5”/3.5” SATA 6Gbps HDD or SSD; 4 x 1GbE LAN ports (expandable to 6x 1GbE or 4x 1GbE + 2x 10GbE ports); 1 x PCIe slot; 3 x USB 3.0 ports. The TS-531P NAS is now available.